Junk. Clutter. Stuff. Whatever name you’ve given the mess that’s built up around your house, it’s time to rid yourself – and your home – of all of it. But what counts as “stuff”? What things should you keep? What things should you get rid of? To help you figure out how to get rid of stuff in your house, we’ve created a list of things to let go of in each room so you’ll know exactly what items to send to the curb (or your local Goodwill) during your decluttering project. Think about what the room is used for – is the item in question needed for that purpose? Test appliances and electronics; if they don’t work and haven’t for a while, they are no longer useful. In the words of Marie Kondo: does the item spark joy? If you don’t like it and can’t use it, pitch it. If important, keep paperwork in a file cabinet close to your computer. If not, recycle or throw it away. Take pictures of your favorite takeout menus and save them in a folder on your phone to eliminate paper clutter in the kitchen. If you’re really set on hanging onto them, place them neatly in a file and dedicate a small file holder to them on your kitchen counter. If they end up cluttering up your kitchen counters or drawers again, that means that the system isn’t working; digitize and ditch the menus for good. Getting rid of stuff doesn’t always mean throwing it away. If you feel wasteful throwing out fast food napkins, put them into your napkin holder and use them all up over the next week or two. For condiments, start using them up at dinner or packing them into lunches over the next few weeks until they’re gone. If you have multiple salad spinners, food scales or cheese graters, it’s time to thin your inventory. Think about what you use most on a regular basis and eliminate anything that doesn’t fit into your usual routine. If your Tupperware cabinet is out of control, go through and get rid of anything that no longer has a matching lid, or anything that is permanently stained. While the fondue set from your great-aunt was a thoughtful wedding gift, if it’s been collecting dust at the back of your pantry, it’s probably best to sell or donate it. If an old piece of kitchen equipment broken and you’ve been meaning to fix it for the last two years, pitch it. If your children are grown, it’s time to let go of their ‘90s Disney plates and cups. If they are in good condition, you can downsize your kitchen stuff by donating them to Goodwill for other children to enjoy. If they’ve been microwaved one too many times, it’s probably best to throw them out. Most of the time, birthday candles end up mashed and forgotten at the bottom of the kitchen junk drawer. If that’s happened to yours, pitch them. If you have holiday or party-themed napkins and plates from more than a year ago, either use them up or throw them out. While it never hurts to have enough kitchenware for additional guests, anything that hasn’t been used in the last year is likely excessive. If your home has collected a number of dishes and plates from parties and other gatherings over the years, try to get the items back to their original owners. If you’re not able to, donate the pieces that are in good shape and get rid of the stuff that isn’t. While plastic bags can be helpful, they can also overwhelm your kitchen if you’re not actually using them up. Most curbside recycling won’t accept plastic bags but you can still get rid of them responsibly. Many grocery stores will accept and recycle your old grocery bags; simply toss a few in the car on your next shopping trip to make sure you’re handling your plastic waste correctly. You can also check out Plastic Film Recycling’s Drop Off Directory to find a recycling location near you. If 99 percent of your screen time is spent on Netflix or Hulu, it’s time to say goodbye to old and scratched up discs and tapes that you’ll never be able to watch anymore. If you no longer use tapes and DVDs, it only makes sense to get rid of the stuff you’d need for them, including VCRs, DVD players and VHS tape rewinders. You can either donate or sell the items online if they are still in working condition. If not, it’s best to dispose of worn-out electronics responsibly. Remotes, cords and other random bits of technology lying around should be the next thing to go. If you can’t identify an item, it’s safe to say you’ll never use it again. Pitch it, donate it or list it online. If you’re having a difficult time deciding how to get rid of stuff in your house, force yourself to imagine a scenario in which a certain item would be useful. If you have to get too creative, and can’t think of a reason you’d use that item within the next year, it’s probably best to let it go. What’s a card deck without an ace? Or a chess set without a queen? Not fun. Get rid of games with missing pieces and donate or sell games you don’t use anymore to downsize your stuff. If your children are grown, it’s time to either donate or dispose of their old playthings. If your little ones are still little, but you’re tired of tripping over toys, designate and organize a playroom area that makes it easy for your children to put away their toys each day. Just make sure to get rid of stuff that’s broken or redundant beforehand. Almost every family has a stack of old magazines hiding somewhere in their living room. Unless a magazine holds some historical or sentimental value to you or your family, there’s no reason to hang onto it. Recycle any paper materials that are cluttering up your living space. If you haven’t been able to locate a sock’s match in the last six months, it’s safe to say that it’s probably disappeared for good. Kick any mate-less socks to the curb. If you have clothing that needs to be mended, either stitch them or ditch them right away. Get rid of old and expired cleaning supplies that haven’t been used up to clear space underneath your laundry room’s sink. Once they’re cleared out, use new cleaning supplies to wipe down the interior of the cabinets before putting things back. Obviously don’t get rid of your house and car keys. But if that unidentified set of brass keys on the hook hasn’t been touched in the last three years, it might be time to pitch it. First, ask your family if they know what the keys might go to. Try them on any safes, closets and other doors to rule out any matches within your home. You may even want to call extended family members to ensure the keys aren’t for a shared family property or a parent or grandparent’s home. If your sleuthing efforts yield no matches and you have all important and necessary keys accounted for, you can get rid of them. If you’ve been hanging onto laundry detergent containers with the hope of reusing them, now’s the time to do it. You can reuse plastic bottles in a number of fun ways, but if you’re not going to do so right now, you should recycle them. As long as you are doing laundry, there will be always be more bottles. Aside from their main purpose of cleaning clothes, laundry rooms can have a number of other, totally different uses depending on who’s using them. Some families use it to store shoes and coats as they walk into the home, while others may use it as a place to keep pet food and supplies handy. 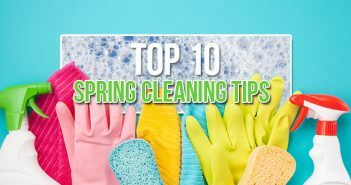 Anything that gets used regularly in the laundry room can stay, but address and get rid of stuff that is just sitting around, especially things that you stored there because you didn’t know what to do with it. Some people keep their supply of batteries in the laundry room, others keep it in the kitchen, but wherever you keep yours, tidy it up by getting rid of dead batteries and organizing the charged ones. If you’re not sure how to tell the difference between the two, there’s a simple drop test that makes it easy to find out which batteries still have juice. Unless it’s important tax information or other documentation that you may actually need down the line, get rid of stuff from past work or school projects. Throw away any used notebooks, pads, papers and folders that don’t pertain to the work you’re doing currently. If you have old business cards lying around, take the time to put the contacts into your phone and then toss them. Try to limit your pencil cup to at or below ten writing utensils at a time. Get rid of any pens that don’t work properly, even if it means getting rid of half the pens in your office. If your company or clients love handing out branded ball-points left and right, you can donate any working pens or pencils to Right-to-Write, a program that distributes writing tools to children in developing countries around the world. If you’re hanging onto crumpled sticky notes or coffee-stained folders, don’t. Get rid of stuff that’s been crammed into your office junk drawer one too many times. Similar to your living room, the home office can be a graveyard for old technology. Downsize your stuff by clearing out any monitors, computer mouses, chargers and cords that have no place in the 21st century. Unless you have a dedicated book shelf to keep and organize your literary collection, hanging onto old books can clutter up what little space you have in your office. If you plan on reading or rereading any of your collection, either order shelving online today or invest in digitizing your collection to save space. If you have no interest in rereading certain materials – like your old accounting textbooks – consider selling or donating them. Your bedside table only needs a clock, a charging dock, a lamp and maybe a notepad and pen – that’s it. Anything else is simply cluttering up the area and should either be moved to a more suitable place in the home or thrown out. Go through the drawers as well to get rid of any thoughtless junk that might have been stuffed in there over the past year. Again: only keep useful bedtime items in these drawers, such as a sleep mask, glasses case, flashlight, phone charger or any nightly medications. You really only need two to three sets of sheets per bed, so if your linen closet is overflowing, it may be time to revisit your bedding inventory. Some local charities may be able to take donated bedding, but always call ahead to double-check. If they can’t take it, or if your bedding is too worn-out, throw it out or donate it to an animal shelter to free up some space. If you’re looking for some quick decluttering wins in your closet, start by getting rid of stuff that no longer fits, things you’ve been meaning to fix and things you haven’t worn in the last year. These are items you likely will not miss and won’t regret getting rid of right now. This includes accessories like belts, shoes and jewelry. Sell or donate anything that’s still in good condition and throw away the rest. Donating to Goodwill is a great way to give back, but not if you’re donating damaged or dirty items that can’t be sold in their stores. When you donate junk to charities, it ultimately passes the burden of disposing it along to them. Be sure to only donate items that are in clean, working condition and that are listed on their acceptable donations list. If you’re ever unsure about an item, always call ahead – your local charity will thank you. There’s no reason to hang onto hangers that can’t hang. Go through your closet and toss any cracked, warped or non-functional hangers. Ever wonder how so many cups end up on your bedside stand each week? Clear out and take all your cups down to the kitchen, designating one to be your nighttime water cup. If you’re clumsy, opt for a cup with a lid or a water bottle to minimize late night spills or knock-overs. Get in the habit of taking any cups and other dishes downstairs with you every morning to prevent the clutter from creeping back. Break out the memory box: it’s time to take a look at your sentimental clutter. To be clear, we are not suggesting that you throw out precious family heirlooms here. We’re just saying that it’s important to evaluate keepsakes to make sure you’re not just holding onto clutter. For example, if you still have a 16th birthday card from a friend whose maiden name you can’t remember anymore, it’s probably time to let it go. There are no strict rules for decluttering sentimental items, but when you’re trying to simplify, it’s always good to be honest with yourself about a photo or item’s worth to you. You might be thinking, “Is there such a thing as too many pillows?” The answer is yes. Often times, a bedroom can wind up with a sea of old, deflated pillows that now need to be stacked four high in order to create a proper cushion. Throw out these old ones and buy two sturdy, new pillows for each person to replace them. The same goes for excessive throw pillows – sell, donate or toss any that you find annoying to remove every day. The stealing of hotel soaps is a sacred ritual for most travelers. But if your spoils are simply being mashed into drawers and cluttering up your bathroom counters, are you really winning? You may be able to get away with moving these to a guest bathroom, if and only if they are useful and can be organized neatly. If you’re not able to do so, it’s best to get rid of them. The most charitable way to get rid of excess toiletries is to donate them to a local homeless shelter where they can be distributed to guests in need. The general rule of thumb is to have three sets of towels per person in your home. If you have way more than needed, you can donate towels in good condition (clean, washed, with no stains or mildew smell) to a local charity. If your towels are beyond saving, donate them to an animal shelter, let your own pet use them in her kennel or go ahead and pitch them. Fill old bags or backpacks that you no longer need with hotel toiletries and blankets or towels in good condition and donate them as care packages to homeless shelters. This is a great way give your old items new life while helping others in need. This includes tooth brushes, razors, tweezers, hairbrushes, eyelash curlers, hair dryers, straightening irons, beard trimmers and really anything else that you only use one of on a daily basis. You can keep up to two of each of these items – one for home and one for travel – but any more than two is excessive. Most of these items shouldn’t be passed along to others for hygienic reasons, but you may be able to sell or donate an old hairdryer. The rest of your hair appliances should be recycled or disposed of responsibly. Toss old medications and medical supplies that you don’t need anymore. You can take prescription pills to a pharmacy or dedicated disposal location, or you can simply throw them away. Extra medicine cups, the kind that come with your bottle of NyQuil, can take a hike too. While you’re at it, if there’s other medical stuff you can get rid of around the house, such as old crutches or wheelchairs from your knee surgery, you can do so by donating them to a local charity or hospital. Did you know that most makeup has an expiration date? If you’ve been hanging onto the same blush for the last three years, your makeup bag might need a quick look-over. Toss any duplicates or makeup items, including nail polish that you tried and will never use again. But save your mascara wands to help save wildlife – The Appalachian Wildlife Refuge’s Wands for Wildlife programs accepts clean, dry wands to help them remove bugs from the fur of baby animals. Like makeup, sometimes you buy a product that doesn’t work the way you’d hoped it would. That doesn’t mean you have to stare at it in your medicine cabinet every morning for all eternity. If you hated the perfume-y smell of that old moisturizer, or the way that bronzing lotion turned your hands orange, pitch it now, because you will never use it up. Keep only the tools that you use on a regular or seasonal basis. If a tool isn’t used often – like a hedge or branch trimmer – and can easily be borrowed or rented, free up some space in your garage by selling or donating it. Pitch anything that’s rusted or not working. If you’re hanging onto old pavers, bricks or concrete blocks in the hopes that you may eventually find a use for them someday, stop hoping, because that day will likely never come. 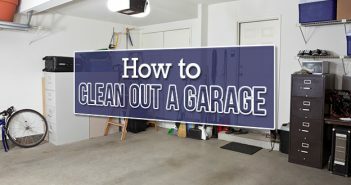 Since most curbside services cannot take heavy debris, these materials can be difficult to get rid of, but there are other ways to handle this type of garage clutter. You can get rid of bricks by putting a flyer out in the neighborhood or recycle concrete at a local C&D recycler – do a little research online to see what options are available near you. Snapped lacrosse sticks, flat basketballs and busted shoulder pads have no place in your soon-to-be-clean garage. Get rid of the stuff that’s unusable. If you don’t use your sporting equipment anymore but it is still in good condition, you can sell it or donate it to a local children’s charity that may be able to use it. Leftover paint can last between 10 – 15 years when stored in the right conditions. But if you find that your leftovers have dried up due to temperature swings in your garage, or you know that you’ll never use that color in your home ever again, it’s best to dispose of the paint properly. You might also want to get rid of stuff like paint-caked brushes and rollers while you’re at it. Coolers and other camping supplies have a way of accumulating in the garage, but unless your home is party central in the summer time, there’s no need to hang onto more than two – a large one and a portable one. You can donate clean, functional coolers to a local Boys & Girls Club or a nearby Boy or Girl Scout troop who might be able to use it for parties, camping trips and other events. If your coolers are busted, they typically can’t be recycled, so you’ll have to throw them away. Before putting it on the curb, take the lid and handles off to make the disposal easier. If you have a can of diesel fuel sitting around but you traded in your big truck last year, it’s safe to say that you can get rid of it. Do not attempt to burn or incinerate fuel, motor oil or pesticides, and do not pour these chemicals down the drain or into your grass. Instead, find a hazardous waste center near you to dispose of these chemicals responsibly. Even if it’s in good condition, there’s a reason you’ve relegated that old couch to storage and it’s usually not because it looks better there. If you have excess furniture, consider donating or selling it online. If it’s in bad shape or has serious pet damage, you likely won’t be able to find any takers. Whether it’s a busted bean bag chair or a dog-chewed La-Z-Boy, get rid of any old furniture that’s on its last legs. When disposing of a sofa bed, make sure to dispose of the mattress properly before taking apart the couch frame. If your old washer and dryer set hasn’t been touched since the day you dragged it down the stairs, it’s taking up valuable space in your storage area. Have a plan to get rid of those ancient appliances lurking in your basement. As Grinch-like as this tip may seem, reevaluating your holiday inventory is a great way to get rid of stuff you really don’t need in your storage room. Take out all of your holiday boxes and identify the sentimental items you want to keep right off the bat. Separate those things from any items that are cheap or may have broken since last year. Test light strands – if they don’t work and a fuse change doesn’t help, get rid of them ASAP. Getting rid of bulky junk like furniture and appliances isn’t always as easy as putting it out to the curb. And while junk removal services are convenient for throwing out one or two things, their per-item costs can add up during big decluttering projects. Learn more about getting a flat-rate dumpster rental for residential junk removal. We know – getting rid of cardboard and other stuff from your Amazon orders can be a pain. But recycling old cardboard boxes and packaging materials will free up a ton of space in your attic or basement quickly. If you’ve got a lot of baggage, it’s time to take a load off. Ideally, you should really only have one large suitcase for long trips and one carry-on-sized suitcase or duffel bag for weekend trips – that’s it. Once you’ve gotten rid of the stuff that’s excessive, make sure to store your smaller bag inside the larger one to optimize your valuable storage space. It can be hard to let go of your baby’s baby days – even if that baby has left for college. But instead of hanging onto old strollers and cribs you’ll never use again, why not pass them along to a child who needs them? When donating baby items, search for them in the Consumer Product Safety Commission’s database to make sure they have not been recalled. Do not donate old car seats, as they can expire and become less safe over time – this is especially true if the car seat has been involved in an accident. It is actually illegal to sell recalled, expired or crashed car seats and other items, so just be sure to do your homework and only donate things that will truly be safe and helpful to the recipient. During your home purge, don’t fret if you can’t decide right on the spot whether to keep or get rid of certain things. 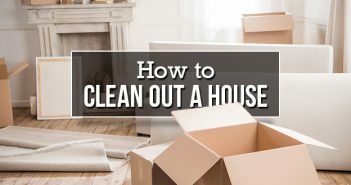 It could mean that you need to think about your home’s organization a little more deeply and create a more in-depth decluttering plan of attack. For the ultimate guide to ridding your home of stuff you don’t want and organizing the things that you do, check out our ridiculously thorough Guide to Decluttering Your Home.